There’s something crazy-making about forthcoming books by authors I love. I obsess over their release dates, cover art, blurbs—and I know I’m not alone in this. Since I discovered the whole preordering thing a couple years ago (yeah, I was late to the party on that one), I take special care to preorder books I’m hotly anticipating in order to ensure that I’m not going to somehow miss one I’m hotly anticipating. Even though we’re barely into fall of 2012, I’ve already pushed that preorder button on five books coming out next year. When I first learned that Lisa’s next YA novel was not going to be in verse, I was a bit bummed out—The Day Before is one of my favorite reads and I just adore her approach to the verse format. However, now that I’ve come to terms with it, I’m actually very excited to see what she’ll do with a traditionally formatted novel. Lisa described this book as mysterious and about “darkness and light,” which really intrigues me, since that’s a theme I usually enjoy in novels. I have to admit to muttering some not-very-grownup words of jealousy when I saw half of Twitter talking about how they snagged ARCs of this one at ALA this year—and I rarely come down with ARC Envy Syndrome. I really liked If I Stay, but Where She Went is one of my favorite reads ever—I was just completely gutted by Adam’s story. I was lucky enough to hear Gayle speak at a little event in Seattle this year and was really impressed with her thoughtfulness and insights into storytelling, so I’m an even bigger fan now. Like the If I Stay series, her next two books will be a duology form two different characters’ points of view, and I really like that style. I’m even more excited that this series is going to deal with the transformative power of travel, because that’s something that was very important to me at the time I was the age of the main character in Just One Day. The amount of time I’ve had to wait between River Marked and the seventh book in the Mercy Thompson series is nearly unbearable. Two years! Two whole years! Yes, I read the latest in the Alpha & Omega series, which takes place in the Mercyverse, but it’s not the same thing! I miss Mercy! Exclamation points! From the blurb, it sounds like this installment will feature Jesse, Adam’s daughter, quite a bit and I’m pretty excited about that, because I’ve enjoyed watching her grow up (yes, it seems like these are all real people-slash-werewolves). I’m also hoping for a more significant Stefan appearance in this installment as well. Whatever—this could be about Mercy and Jesse going to Costco and I’d preorder it. 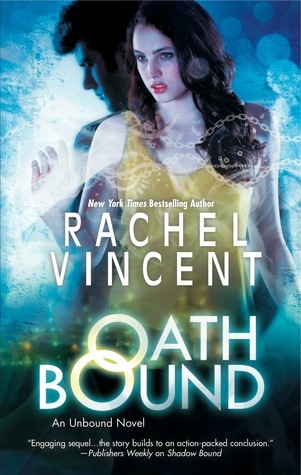 I was certain this one was releasing earlier in 2013, but, sadly, I’ll have to way until May for the conclusion to Rachel’s really marvelous Unbound series, which takes place in an alternate U.S. which is controlled by mob syndicates whose power is related to controlling magic-like “skills” some of the population possesses. The final book introduces two entirely new characters, and the ending of Shadow Bound was intense, to say the least, so I’m certain that Oath Bound will be very intense. I’m alternately happy and sad this series is ending with three books. Sad for obvious reasons (I have loved this series); happy because I think the story doesn’t need any more than three, and I love seeing an author end a series when it’s time, and not dragging it out forever.